It is still not clearly known to the human world when exactly was the Tirumala Temple constructed on the sacred Seshachala hills and when exactly was the most popular celestial festival on earth, the annual Tirumala Brahmotsavams have been launched.. However, here’s an interesting true story that more or less gives us some idea about how these two major historical developments have taken place on the seven hills..
Thondaiman, brother of King Akasa Raja, had clearly noticed at the time of his brother’s daughter, Princess Padmavathi’s (Goddess Padmavathi) marriage with Srinivasa (Lord Srinivasa), how all the Gods and Goddesses have specially come from the Celestial World (Deva Loka) to witness the marriage. He had also seen, at the time of the marriage, how so many great Sages like Agastya, Suka and Vasishta Maha Muni have come from far off places to bless the divine couple..
After that, Thondaiman was thoroughly convinced that his brother Akasa Raja’s son – in – law, Srinivasa is none other than Lord Sri Maha Vishnu Himself, who had come to this world to save humanity from the sins and evils of the Kaliyuga. After that great realization, Thondaiman became a big devotee of Lord Srinivasa and took many favors from Him, including His Conch and Sudarsana Chakra which Thondaiman later used during a war. A few months after performing his daughter Padmavathi’s marriage with Lord Srinivasa, the King Akasa Raja passed away.. There was then a big battle between Akasa Raja’s brother Thondaiman and his son Vasudasa to capture the departed king’s throne. On Padmavathi’s request, Lord Srinivasa intervened and divided the entire kingdom into two important regions leaving thirty two villages to Padmavathi as well, as She rightfully deserves a claim in her father’s property. Later, Lord Srinivasa along with His consort Padmavathi left for Sage Agastya Maha Muni’s Asram (Hermitage) and stayed there. After a few months of peaceful ruling. King Thondaiman – who had by then earned a name for himself as a great king, a greater administrator and the greatest devotee of Lord Srinivasa – had started feeling terribly restless for not being able to see Lord Srinivasa as frequently as he had seen Him earlier when He was staying close to his kingdom. There was also a feeling of guilt in Thondaiman’s mind that he is solely responsible for the death of a few members of a noble Brahmin family who were great devotees of Lord Srinivasa. Although, Lord Srinivasa had later brought all those Brahmin family members back to their life, He too was very much upset with King Thondaiman’s irresponsible behavior towards His devotees. King Thondaiman went to Sage Agastya’s Asram and sought the personal audience of Lord Srinivasa.. On being granted permission for the same, he prostrated before the Holy Lotus feet of Lord Srinivasa and said..
“O’ my beloved Lord Srinivasa.. You are the creator of this universe and You are also the One who is controlling the life of every living creature existing in this Universe.. All these days, out of my ignorance, I could not honor You the way a divine Lord like You is meant to be honored. My Lord.. I may have done so because I have considered You more as my relative than as the supreme commander of the Cosmic forces ruling this world… My Lord, I have now realized my mistake.. Please forgive me for my ignorance and also for the mistakes that I have so far committed – either knowingly or unknowingly – in my life. My Lord, am fed up with this life I have so far lived and with the politics that I have so far conducted.. Am tired and do not wish to lead this life any more this way. Because, my Lord, this fame is miserable.. This glory is miserable.. This wealth is miserable.. These pleasures are miserable.. These luxuries are miserable.. These battles for supremacy are miserable and this way of leading a royal life with fake diplomacy is furthermore miserable. Miserable is this life and miserable is the glory associated with this life.. O’ my Lord.. I beg you to please understand my agony and grant me the permission to lead the rest of my life as Your humble servant at Your Holy Lotus Feet. Only this noble service at your sacred Feet can offer some solace to this sin filled pilgrim’s mind.. You have given me enough for this life, my Lord, and I do not need anything more than this.. Please bless me My Lord.. Please bless me”. Saying so, the powerful King Thondaiman, with tears rolling down his cheeks, broke down at the Lotus feet of Lord Srinivasa.. Holding him by his shoulders and lifting him up, an ever smiling Lord Srinivasa said. “O King.. You have pleased me with your modesty and devotion.. Am convinced.. Now listen to me carefully.. I have come to this world with a purpose and it’s now complete after my marriage with Padmavathi. Hereafter, my duty and responsibility towards this mankind begins.. Time has now come for me to leave this human form and shift into the form of a stone idol. I shall now go up the Seshadri hill, along with my wife Padmavathi, and reside there to offer My blessings to the devotees who would come to see Me in future.. It is also my responsibility from hereafter to protect all my devotees from the evils of this sin filled Kaliyuga. However, to all the holy Sages, Gods and true devotees I would still be visible in a human form.. If not in this form certainly in some other human form.. But in whatever form he may see me a true devotee would certainly identify me. Rajaa.. Am now granting you the opportunity to construct a temple for me on the Seshachala hill at the place offered to Me by Sri Varaha Swamy on the Southern side of Pushkarini.. Come with me”. Saying so, the holy Lord Srinivasa, accompanied by his wife Padmavathi and Vakula Devi, took King Thondaiman personally on to the Seshachala hill.. Showing him a particular place near the Pushkarini, the holy Lord said..
“O Raja in the Temple, am asking you to build for me, I wish to have seven entrances, three baileys and two domes with the main entrance facing the Eastward direction. I also want all the facilities in the Temple like Asthana Mandapam, Yaaga Mandapam, Snapana Mandapam, Vastrala Gadhi (Room for silk robes), Bali Peetham (Altar Of Sacrifice) and a tall Dhwaja Sthanbham (Flag Staff) ‘. Saying so, Lord Srinivasa took Thondaiman to a nearby place and showing him a tree, He said, “Look at this Tamarind tree Raajaaa.. This tree offered me great service and hence is so beloved to me.. Preserve it carefully forever and leave ample space for this tree in the Temple”. Finally, King Thondaiman had built the holy Tirumala Temple exactly the way he was instructed by Lord Srinivasa to build it.. In fact Thondaiman, much to the pleasure of Lord Srinivasa, had recreated the entire Vaikuntam (Lord Vishnu’s celestial abode) on the Seshachala hill. Consecrated with Vedic hymns by the Sages and Gods, the Tirumala Temple tower was named Ananda Nilayam – the abode of happiness..
During the celebrations, Lord Brahma took a promise from Lord Srinivasa that He (Lord Srinivasa) would reside on the Seshachala Hills till the end of the 28th Kaliyuga and shall redeem all the sins of His devotees who would visit the Tirumala Temple. Lord Srinivasa smiled and agreed..
“These oil lamps shall burn eternally until the end of this Kaliyuga and in the end go off on their own, signalling the end of Kaliyuga… After that signal, holy Lord Srinivasa shall return to Vaikuntam and this holy Ananda Nilayam would collapse”. 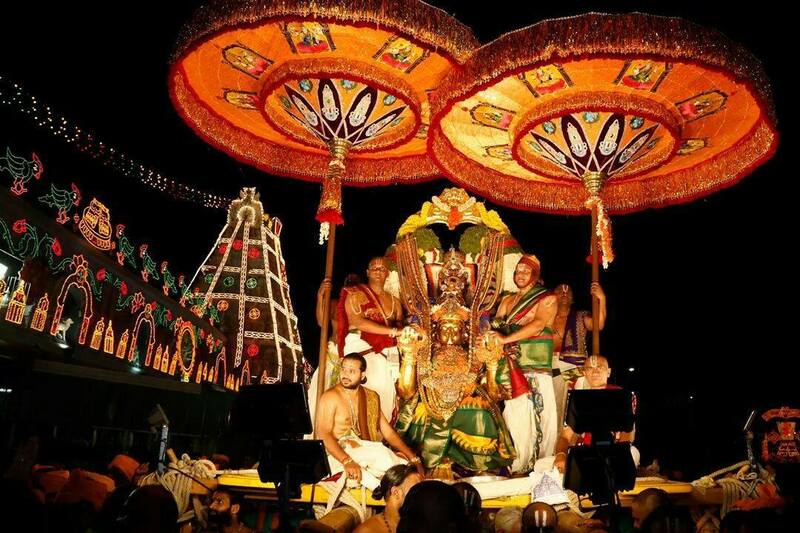 Lord Srinivasa smiled again and said, “My son, now arrange for a separate festival for Me wherein right from Dhwajarohanam to Rathotsavam, Am taken out in a procession on one celestial vehicle each day. Lord Brahma obliged and immediately called for King Thondaiman and told him..
“O Raja.. Make quick arrangements for the construction of rich and colorful chariots that are decorated with Golden umbrellas.. Our celestial architect, Viswakarma shall assist you during the making of these Chariots… You may also take his full support in completing this entire task at the earliest”. Lord Brahma then called for Viswakarma and introduced him to King Thondaiman and ordered him to offer whatever support Thondaiman would require, thereafter..
Later, personally supervising every aspect of the festival, Lord Brahma, as per the instructions given by Lord Srinivasa, invited all the Gods and Goddesses to that grandest festival on the planet. He had also sent invitations to all the Kings of Anga, Vanga, Kalinga, Kashi, Kambhoji, Kerala, Virata, Jaangala, Pegandula, Barbhara, Pandyam ,Chedhi, Matsya and Sindhu kingdoms among others.. Finally, on an auspicious day (Vidiya).. 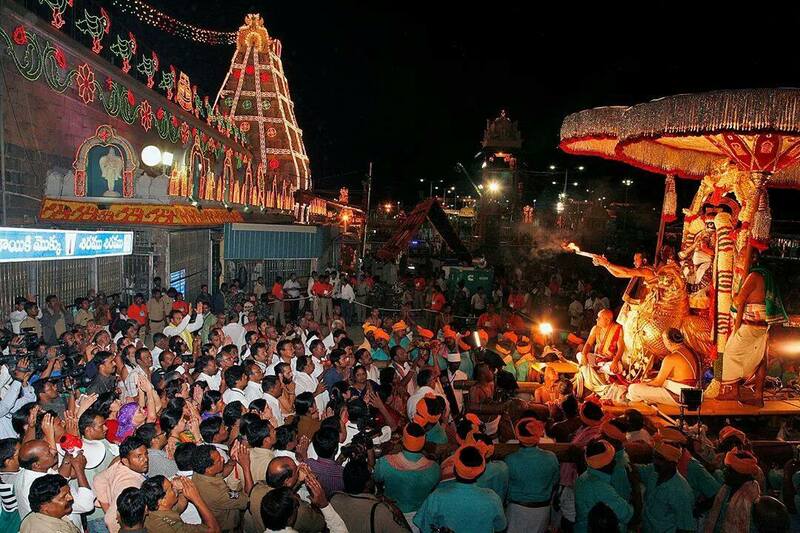 When the Sun God entered Kanya Raasi, and when Lord Brahma and all the other Hindu Gods and holy sages were chanting the sacred Vedic hymns, the first glorious festival of Sri Vari Brahmotsavams began on a never before seen grand scale, on the holy Tirumala hills, with the inaugural event of Dhwajarohanam .. Initially, these Utsavams were called Srinivasotsavams but with the passing of time became more popular as Tirumala Brahmotsavams.